Today's fragrant slice comes in the shape of tiny medallion shaped cookies. My taste buds were in heaven. With a burst of orange zest and just a hint of cardamom, these tiny bites went very well with a pot of black tea. Beat butter till soft about two minutes, add sugar and blend well. Add egg yolk and orange zest. 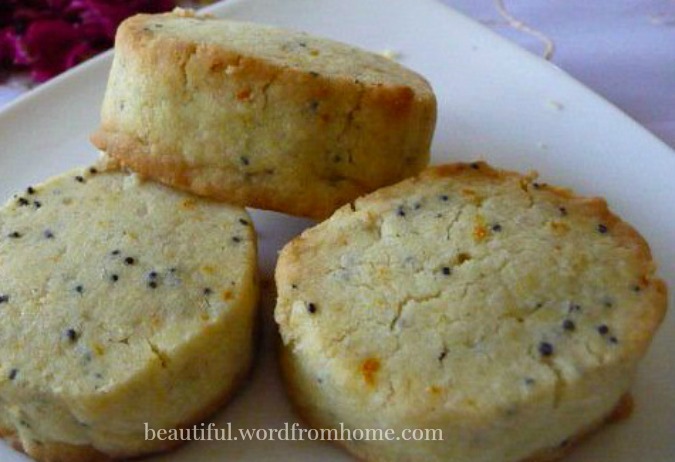 Combine flour, salt, cardamom and poppy seeds; fold in to batter. Mix just enough to combine dough. Form dough into 2 logs, wrap in parchment and chill 30 minutes. Slice logs into 1/2 inch thick rounds and place 1 inch apart on sheet. Bake 12 - 15 minutes or until slightly golden around edges. Dough can be frozen 2-3 weeks and used later. Makes about 3 dozen. Cookies. Tea. And this delightful book to finish reading. Contented sigh... I'm so grateful for this fragrant slice of life. Lovely to slow down to enjoy the fragrant slices of life and even to create some fragrant slices of life. Thanks for this recipe. It sounds like the perfect complement to the tea table. And what I really enjoyed about the recipe (besides it being so delicious), these cookies were so simple to make. Whipped them up in 5 minutes, let them chill, and soon they were in the oven. These sound absolutely lovely! Cookies for grown-ups! I must try them. Thank you for publishing the recipe and for your excerpts from the book. I like how you described them...cookies for grown-ups. It's true. I think hubby brewed us a 'Yorkshire' blend -- it seemed a perfect pair. And the cookies are sublime. Susan, Lovely to hear from you! And yes, the cookies are lovely. I almost want to go try baking some right now BUT it will be 102 degrees today where I live...maybe next winter-lol! These sound so delicious. Just the thing to accompany a cup of tea. These look very good. I will give them a try. A technical question: When I made these, I did as the recipe suggests and rolled the dough into 2 logs. After chilling, I cooked one. The cookies were good, but there was a harsh, butter aftertaste. (My son-in-law's agreed with me, but pointed out that you only notice it when you stop eating, so the solution was to keep eating....) BUT here's the mystery: the other log sat in the refrigerator for a week (more or less) and, when those were sliced and cooked, there was no harsh aftertaste. Something had dissipated, but.... what? Any ideas?